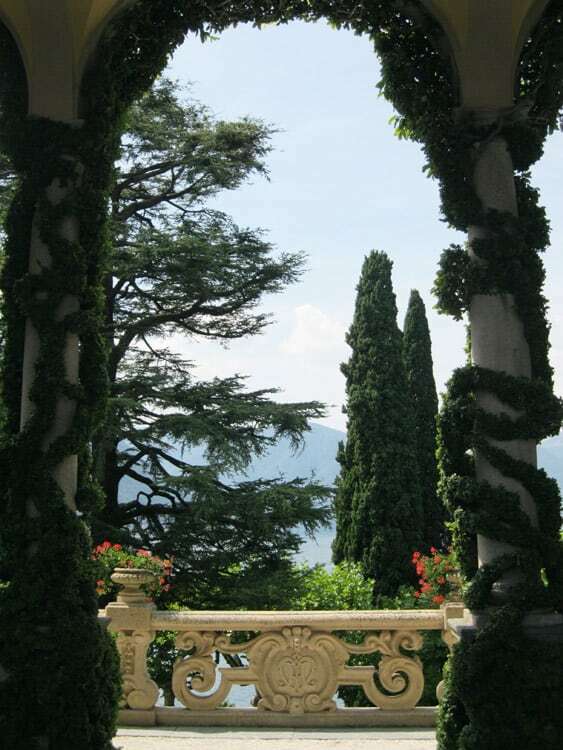 I had always wanted to see the gardens of Lake Como and it came as a surprise, on a weekend trip to Milan, to find that I was only 35 minutes from Como by train. This proved to be an ideal arrangement – good food, sights, shopping, and more good food in Milan, a short train journey, and then that wonderful, leisurely ferry ride up the lake from Como, slowly criss-crossing from village to village. The backdrop is some of the most spectacular scenery in Europe, of wooded mountains descending precipitously to the lake, beautiful lakeside villas, and delightful villages. 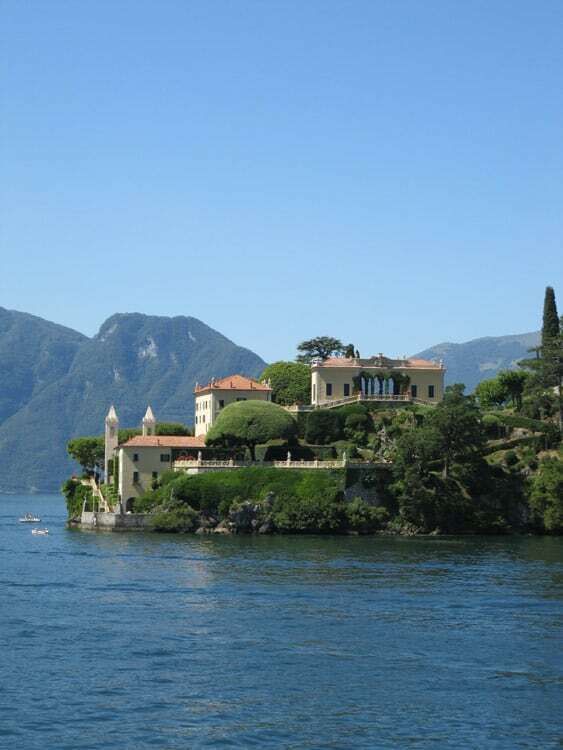 It is a journey that induces a feeling of calm and wellbeing, and sets the stage for a visit to one of the Italian Lakes best regarded gardens, Villa del Balbianello. 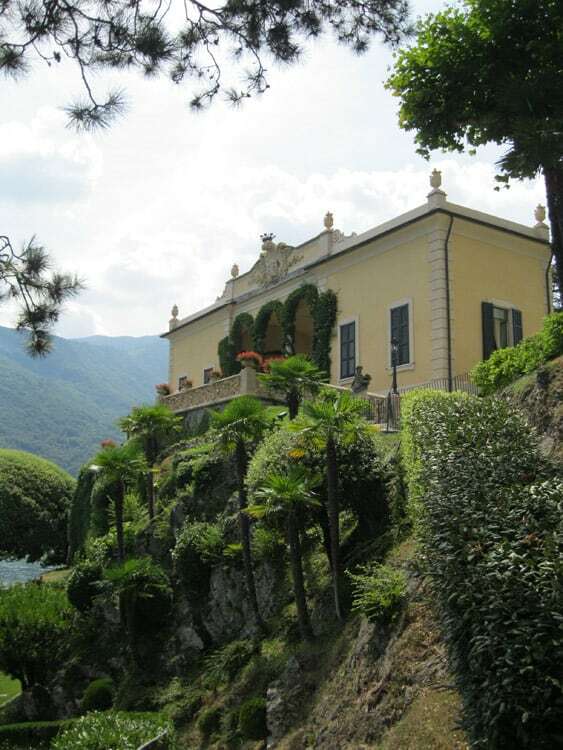 The closest ferry stop to Villa del Balbianello is the picturesque village of Lenno, but the villa turns its back on the village and is completely hidden from it, and the approach through rough woodland brings you out at the wrong end of the garden. This I first tried, before going down to Lenno’s small harbour and taking the short motorboat ride, a much better approach, arriving at the villa’s stylish formal landing stage. The garden ascends and unfolds before you. Surprisingly, Balbianello is a late 20th century garden. The villa had fallen into disrepair, and was bought in 1919 and restored by Butler Ames, a retired American general who lived there until 1974. Ownership then passed to Count Guido Monzino, and it was he and landscape architect Emilio Trabella who created this remarkable garden. After Monzino’s death in 1988 the garden was bequeathed to the Fondo per l’Ambiente Italiano (the Italian version of the National Trust). Already excited by the lake’s spectacular scenery, I found Balbianello’s setting breath-taking. The three levels of the buildings fit comfortably into the rising hillside, with huge clipped domes of evergreen oak, pencil-thin junipers, cedars and pines, contrasting with the rocky foreshore and wild woodland of the adjoining areas of the estate. Not only is there a fabulous lake promontory location, but it is difficult not to be impressed by the remarkable and thoughtful attention to detail in hard landscaping, design and planting. On my visit, from a high ladder, a gardener was painstakingly using scissors to trim a long high wall covered with creeping fig; at least a two, possibly a three day job. 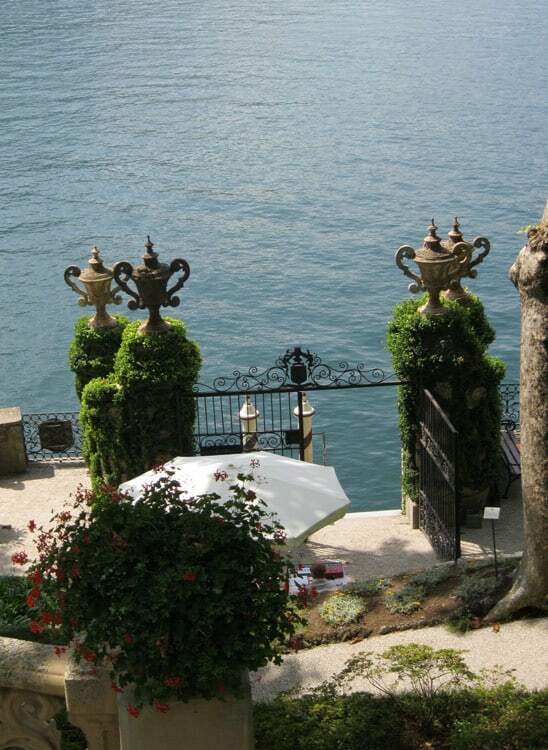 For me, the uniqueness of Villa del Balbianello, ‘the genius of the place’, lies in this European adaptation of a fastidious Japanese approach to clipping, training, and pruning, contrasted against the amazing grandeur of its rugged lake setting. 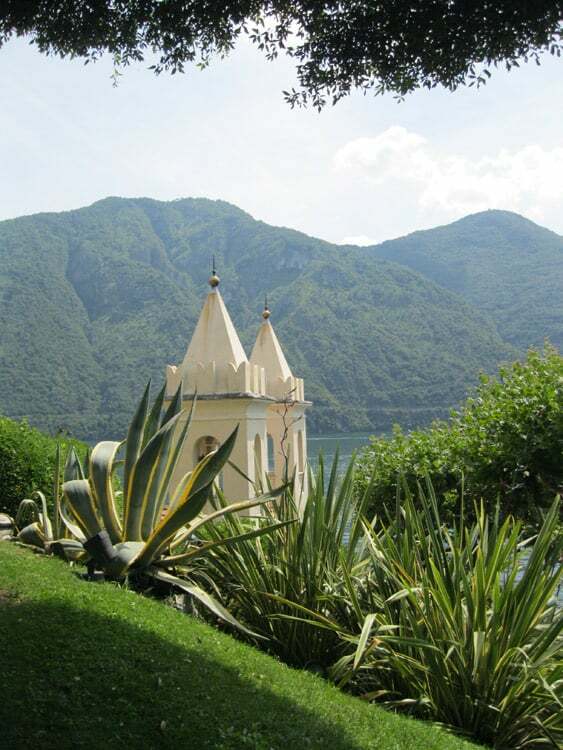 Arriving at the lakeside jetty with its red and white candy striped poles, ivy-covered pilasters and elegant urns, steps rise past a large bed of agapanthus to the first level, which faces the chapel with its two distinctive bell-towers; all that remains of a former Franciscan monastery. Beds of dark green grass-like ophiopogon under the shade of the trees contrast well with the ascending manicured lawns. The main part of the villa, built in 1787, lies at the second level, reached by gently rising paths, past low rough stone retaining walls festooned with ivy swags. 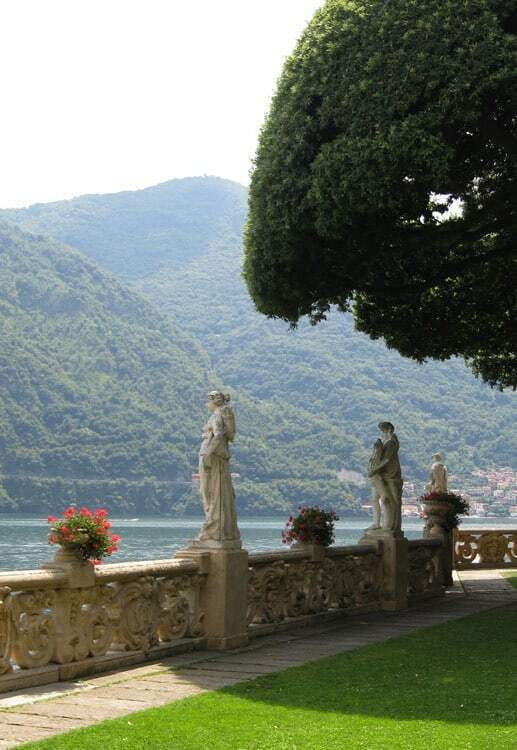 Lakeside terraces wrap around the hillside, with raised classical statues alternating with jardinières overflowing with trailing scarlet geraniums. Everywhere is understated elegance. The third level is The Belvedere with its three-arched open loggia, dining/music room to one side and library to the other; and with stunning open views over the whole lake. The clipped hedges and banks of evergreen box and bay emphasise the structure of the garden. The return path down to the landing stage passes along the top of a steep curving bank, planted with a row of pruned plane trees with high neatly-clipped ivy collars. 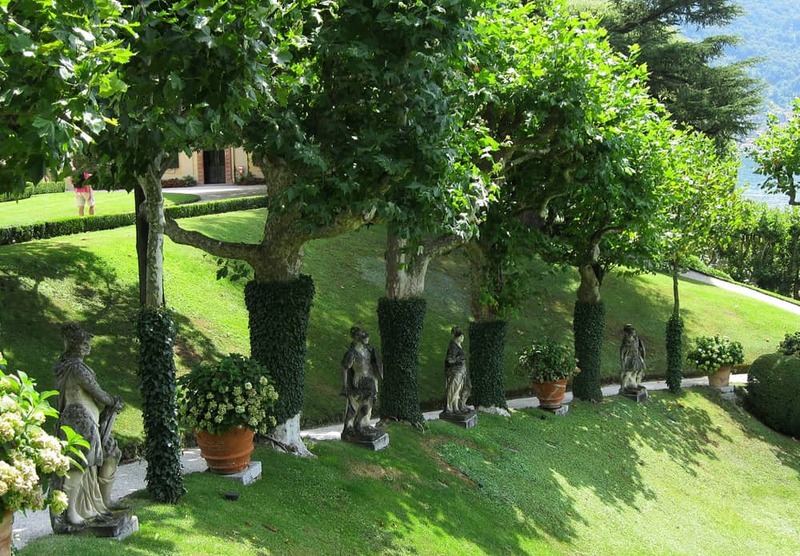 These are interspersed with more classical sculptures and large terracotta pots of white hydrangeas, which frame the views out over the lake. The garden seems open and exposed, but at the same time private; a difficult thing to achieve in design terms. Villa del Barlianello is that very rare and extraordinary thing, a faultless garden, something I don’t recall every coming across before.